Occupy Santa Barbara. 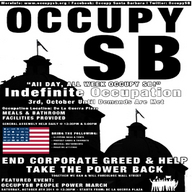 #occupysb #occupysantabarbara Corporations have gained the human rights lost by citizens in post-9/11 America. 1% of Americans possess 42% of America’s money, giving a few people political power. If we break the data down further we will find that 93% of all financial wealth is controlled by the top 10%of the country. Join us in De La Guerra Plaza and be heard as a member of the 99%.